The best Satellite Tracking program I've ever used and excellent support - Terry Gaff on Twitter. WXtrack is used by many Universities and satellite enthusiasts across the world, and is also used within the industry - NASA, Surrey Satellite Technology. If you would like a custom version for your project, just e-mail me. See WXtrack in Embarcadero' Delphi Application Showcase! WXtrack registration - help support continued development! 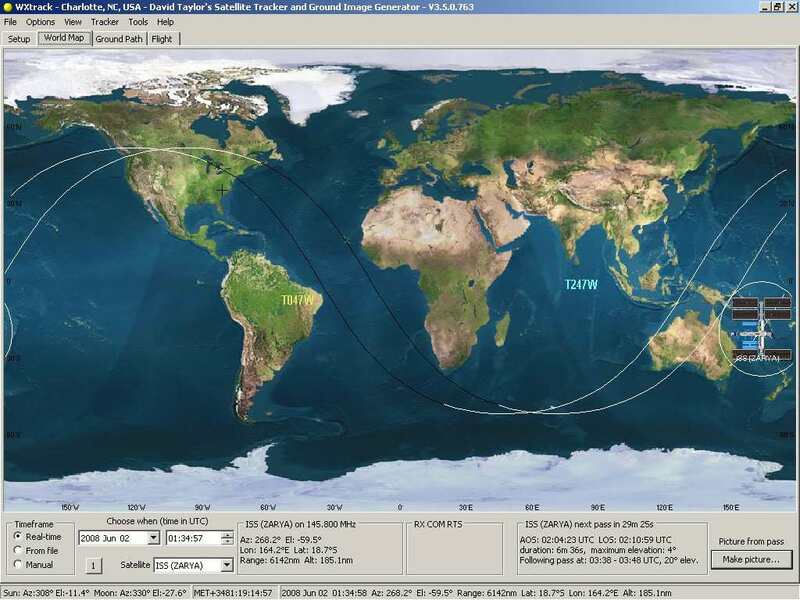 Multiple satellite tracking, with night-time shading. WXtrack in ISS mode, simulating the NASA wall display. (Click for more information) This program, which I have described in more detail, is designed to predict the tracks of satellites both as paths above the earth, and as images produced by these satellites when scanning the ground. It was designed for use during the early stages of my weather satellite receiving activities, when clouds and interference prevented easy identification of what I was actually observing! Read more about using WXtrack. The core orbit prediction elements are also available as a component that you can use in your own software. This program is free for amateur use, but if you do wish to say "thank you", or you want technical support, or you want the advanced facilities, you should register WXtrack. 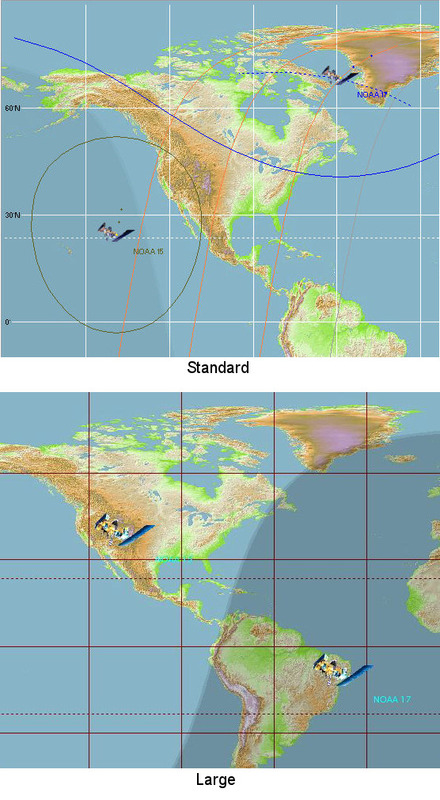 WXtrack can read processed satellite images from one or more folders of your choice, and present these images side-by-side with the ground track prediction. To make visual correlation easier, minute markers are produced on the predicted image to match those on NOAA APT transmissions. Because of the graphics used in this program, it really requires a display of 1024 x 768 or better resolution, but it will work on 800 x 600. Sample of the results using the full 18MB ground topography database. WXtrack can drive a number of popular antenna tracking systems including controllers based on the WiSPDDE, AMSAT's LVB tracker, EA4TX's ARSWIN, Kansas City Tracker (RR.DLL and ON1CIM's KctTracker.exe), Las Vegas Boulevard (LVB from G6LVB), SeaTel, CX6DD (supports Yaesu GS232), EasyComm, IF-100 and FodTrack standards. There are options for early startup of the tracker, antenna offset, flip-mode, antenna parking at pass end, running a command at start-of-tracking etc., and the program has a quick point-at-object mode for setting up your antenna with the sun, moon etc. If you have another tracker that you would like supported, why not write to me and ask? SDRs are supported both through the excellent HDSDR software, and the equally good SDR# software with the DDE add-on. Users have asked for support on this software, and wish to say "Thank you", so I now provide extra facilities to users who do register WXtrack. Commercial use of WXtrack requires purchase of a commercial licence. The extra facilities are designed to make the program easier to use for regular users, and to extend the facilities available. LARGE TEXT showing the tracker location from the other side of the room! A Satellite Summary form is available by right-clicking the World Map display - includes MA display, nearest city in addition to azimuth, elevation range etc. The latitude and longitude of the mouse on the World Map is given in, and the range and bearing from the home location. Display extras e.g. some ISS mode features, multiple ground station footprint display. Here's a screen-shot of the registered WXtrack in full ISS display mode. Input from GPS for location and time setting, GPS prediction mode. Satellite priority setting and automatic switch to next available satellite. Option of restricting passes tracked to those in the pass list. Quick access to Sat Batch and Kepler Manager through the Tools menu. The Tracker Test command is considerably enhanced by adding offset control, manual positioning and RA/Dec tabs - ideal for tracker setup and testing. The tracker parking option is available. You can select finer time steps for the pass details list. HRPT channel selection is possible with the Götz Romahn/Bob Barnes CX6DD tracker variant. More information about some of the extra facilities. Windows XP, Vista are likely to work, but are not tested here, and are not supported. Memory: 32MB or better, 64MB highly recommended. Display: 800 x 600 resolution or better, 15-, 16- 24- or 32-bit colour recommended. WXtrack works best with Normal font size. The runtime Library Bundle listed below is necessary for WXtrack to function. If you get error messages about missing DLLs when you try to run WXtrack, please consult the library notes page. Got a question? Check out the FAQs. There is a free self-help group that you can join here, where other users of the software can be contacted. The Country & State boundary data is required if you wish to generate image overlays for adding to actual pictures with SatSignal, and for certain map projections. If you have less than 32MB memory in your system and want to run overlays, it may be worthwhile downloading the Pre-compiled overlay bitmap as the program will struggle to generate the 31MB bitmap in a 24MB or less system! Copy the expanded Overlay.bmp file to the program's executable folder. If you wish to change grid-line spacing, add longitude and latitude annotation, or put the grid on top of the countries, please download MakeOverlay program listed under optional items below. If you have a problem with your PC being permanently set on Daylight Saving time, which happens with certain versions of Windows 98, try the Time Zone Editor from the Microsoft Windows 2000 Resource Kit. This program, TZEdit, enables you to define your Time Zone details. More information. If you are driving a tracker in real-time, for more accurate tracking be sure your PC is keeping accurate time. If you have customised any of the standard files, be careful not to overwrite your customised files with ones from the Zip archive! Take the WXtrack.exe, the WXtrack.chm and the WXtrack.txt first. Please note that while the Kepler orbit data supplied with the download was current at the time the download was prepared, it will be out-of-date by the time you start to use the program, and you may therefore get a warning about "WXtrack could find no satellite data". If that happens, just run the Options, Kepler update... menu function. You are responsible for ensuring that the program has up-to-date information if you want the most accurate results. Registered users of the program can achieve this automatically with the Kepler Manager software, for which their WXtrack licence is also valid. V3.8.40 Handle background being deleted behind our back more elegantly, include "or out-of-date" in "No Keplers" message, reduce minimum pass time from 30 to 5 seconds, save tracker precision setting in unregistered version, add SpectraVue support (testing, enable SpectraVue in Tracker, Options, attempts to set RX mode and centre frequency including Doppler shift based on requested nominal frequency when tracking, option to get nominal frequency from Radio.ini), add separate continuous DDE tracking (satellite name without spaces, just as the original DDE), add items to "ContinuousTracking2" DDE item under test. Help updated about Radio.ini. V3.8.42 Display correct date for solar outage. V3.8.44 Add Mercator projection, eight satellite banks up from four, show Kepler data on a larger form, refine stale Kepler limits ("ignore" default 12 months, polar "stale" 30 days, geostationary stale 65 days), updated TLEnotes.txt (added sample file frequencies-va3dbj.ini, thanks to Dave Bate). V3.8.46 Add pass-box for Sentinel 3A in ScanOffsets.ini (treat as being in the "weather satellite" class), in View|Radar plot add Galileo satellites, add count of navigation satellites visible (you will need the Keplers from e.g. CelesTrak - galileo.txt), enlarge View|Radar plot display, provide hints for long satellite names in the Available list, use 10 GHz as default for geostationary Doppler, restore SPID half-degree support, in Tracker Test form add slower updates for geostationary satellites and add 0.5 degree offset tweaks, enhancements in Kepler update form. Temporarily: display DDE RX mode in the tracker status box (for debugging). Please be careful not to overwrite your current Kepler data, or other local customised data, with out-of-date info! Please note that Windows-XP and Vista support has been dropped in versions after V3.8.26, and although the software should continue to work, it is no longer guaranteed or supported on older versions of Windows. In Windows-7 and later it is recommended to install WXtrack into C:\Tools\SatSignal\WXtrack\. If installed into C:\Program Files\ some functions will not work. Got a question - check out the FAQs! ETOPO5 data can be found on the National Geophysical Data Center site. Right-click this link, and save as etopo5.dat. The file is not zipped, and is quite big at 18MB, and the site speed seems limited - allow a good five minutes! KeplerManager program for automated Kepler updates. For SARAL Kepler elements, download resource.txt from the CelesTrak Web site. Right-click on the link and use Save Link as (or similar) to save the file in your WXtrack or Kepler directory. SDR# add-on - control radio frequency on SDRSharp from WXtrack. Want to run WXtrack from a Flash drive? by Peter Pauly explains all about Creating a Portable WXtrack. Satellite frequency and launch date TLEnotes.txt zip file updates from David Bate, and his frequencies.ini file. Frequencies.ini file with 584 satellites from alternative data with 584 satellite frequencies, update 05/01/2014, from: uhf-satcom.com - Twitter @UHF_Satcom, rename to frequencies.ini before use. The source which may be more up-to-date is here. Want to ask a question - ask the WXtrack self-help group! The ARSVCOM emulates several interfaces as Yaesu GS232A or Prosistel "D". So, you don't need to modify anything in WXtrack, because I suppose you already support the GS232A or PST "D". The ARS-USB Product includes the ARS-USB Interface and a program called: ARSVCOM. Once the ARS-USB Interface is connected into a USB Port (Windows, Linux or MAC OS X) a serial/COM port is added to the computer (Example: COM5). Without any additional program, any program can use this COM port and send/receive commands from the unit. The ARS-USB emulates a Yaesu GS232A interface, so it's mandatory that the program send the same commands as a Yaesu GS232A. 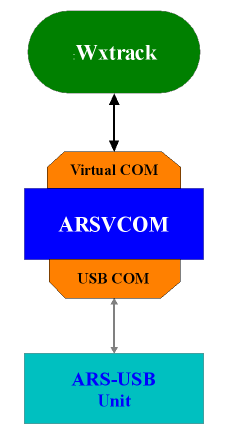 1 - First, the ARSVCOM can create an additional Virtual COM Port (Example: COM7) and via this virtual COM Port, can emulate several interfaces (GS232, PST "D", etc). 2 - Then, he must configure the ARS-USB Port assigned by Windows (example: COM5) so the program can control the interface. 3 - Finally, configure a 3rd party program (Example: WXtrack) to use the Virtual COM Port (COM7). Basically, WXtrack will send GS232A commands to the ARSVCOM and those commands will be processed and routed to the USB Port. (Information kindly supplied by Paolo). O ARSVCOM emula várias interfaces como Yaesu GS232A ou Prosistel "D". Assim sendo, não precisa de modificar nada no WXtrack , porque eu suponho que você já suportam o GS232A ou PST "D". O Produto ARS- USB inclui a interface ARS- USB e um programa chamado: ARSVCOM. Uma vez que a interface ARS - USB é conectada a uma porta USB (Windows, Linux ou Mac OS X) ou a uma porta serial/COM adicionada ao computador, (exemplo: COM5). Sem nenhum programa específico, qualquer programa pode utilizar esta porta COM e enviar/receber comandos da unidade. A ARS - USB emula uma interface Yaesu GS232A e por isso é obrigatório que o programa envie os mesmos comandos para o Rotor Computer Interface Yaesu GS232A. 1 - Em primeiro lugar, o ARSVCOM pode criar uma Porta COM virtual adicional (Exemplo: COM7) e através desta Porta COM virtual, pode emular várias interfaces (GS232, PST " D ", etc). 2 - Em seguida, ele deve configurar a Porta ARS - USB atribuída pelo Windows (exemplo: COM5) para que o programa possa controlar a interface. 3 - Por fim, configure a 3ª parte do programa de (exemplo: WXtrack) para usar a porta COM virtual (COM7). Basicamente, o WXtrack vai enviar comandos do GS232A ao ARSVCOM sendo os comandos processados e encaminhados para a porta USB. (Informação gentilmente cedida por Paolo). Translation by: Eduardo Mata, thanks! You can download these icons, which have been contributed by WXtrack users, to show the International Space Station and Space Shuttle (ISS and STS) on your WXtrack display. Note that the STS, Progress and Soyuz icons will need to be renamed with the NORAD catalogue number for each new launch. Copy the contents of the zip file to your WXtrack directory. My thanks to those who have made their work available to the WXtrack community. These icons may not be used with software other than WXtrack without the specific permission of the icon author. Here's a screen-shot of the registered WXtrack in full ISS display mode. 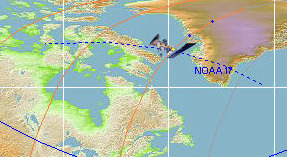 Screen-shot of ISS and STS icons in use. directory in the Zip archive. Remember to rename the icons with the NORAD catalogue number before use (37820 = Tiangong 1). Jörg lives near the home of the first German cosmonaut. Screen-shot with some of these icons in use. Includes renovated ISS (and without the STS), Progress, Soyuz, ATV and reversed shuttle, Hubble, and X38-B. Not all shown here. George has provided updates to his icons in June 2012. Michel Casabonne world map - showing the South Atlantic Anomaly (SAA), the region where Earth's inner van Allen radiation belt makes its closest approach to the planet's surface (836 kB). L'information française de WXtrack est de Jean-Louis Fenasse (merci beaucoup!). If you like this software, you can rate it at the DXZone web site that lists related programs. Rate this Software @ The DXZone. Be sure to register WXtrack and help support continued development. I am very grateful to the late Ferran Alegret for providing a Spanish language version of the help file, which may be obtained directly from his Web site, and to Jean-Louis Fenasse for the French language help file and information. Thanks to Roger Hedin for his additions of some lakes and island groups to the original Country & State boundary data. George Ioannu provided the WXReceiver program for automatically scheduling reception. David Bate suggested the MET display, and provides data updates. The orbit prediction code was derived from Dr T S Kelso's Pascal units on his CelesTrak web site. Many thanks to Dr Kelso who very kindly gave permission for his code to be used. A component that can access the SGP4 model based on Dr T S Kelso's code is available from this page. Without Dr T S Kelso's code, WXtrack would not have been possible. Imagine that you are flying in space, looking down upon the Earth. All your favourite satellites are visible, and you can fly around to your heart's desires. Oh, and it will cost you nothing! Yes, that's WXtrackGL. You can choose when and where, and which satellites are displayed. You can set whether you manually control the program, or get an automated ride on the satellite! V2.1.0 Updates the program to allow it to act as a viewer for any data presented on a world-map projection and generalises the time steps. Make solar illumination optional, add higher-speed modes, add solar & lunar viewpoints, allow background image choice, add persistence of selected settings. V2.1.2 Improved error messages, give folder name if no Keplers found, suggest user downloads WXtrack. V2.2.0 Add support OpenGL 2.x systems. NOAA-16 coverage from New York Imagine if you could superimpose all the passes for a given satellite for a week or a month ahead. You would end up with a plot showing the coverage from your location. This simple program allows you to do just that, and provides a text file of the results for any further processing you wish to make. Experimental, unsupported program. Requires the SGP-4 component V3.2.0 listed below. The screen shot to the left shows the coverage to be expected from an HRPT station located in New York. Note the differences between north-bound and south-bound coverage shown as red and blue lines. Do you want to use the same prediction code as in WXtrack? Perhaps you want to call it from Visual Basic, Visual C++, Visual C#, Java, a Web page, or even a batch file. This component is for you! 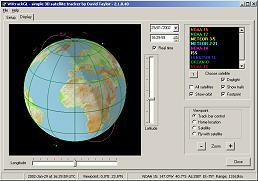 I have made available the core SGP4 model satellite prediction routines used in WXtrack as an Active-X DLL component. This allows you to call satellite prediction routines from any program, Web pages using ASP, or even from the command line by using the Windows Scripting Host. Working samples are provided showing how to obtain a list of passes with Microsoft Visual Basic, Visual C#, Visual C++, Borland's Delphi, using the Windows Scripting Host and using Active Server Pages. As in WXtrack, the core code is from Dr T S Kelso's Pascal implementation of the highly accurate SGP4/SDP4 orbital model. Many thanks to Dr T S Kelso for making this code available. V3.2.0 Add access to satellite state. 2002 Apr 05 Updated Les Hamilton's VB5 demo. 2003 Jan 15 documentation update. V3.4.0 Add Period function and access to Kepler data, add MeanAnomaly to Kepler data, add MakePassDetails function. 2005 Feb 26 - updated Les Hamilton's VB5 demo. 2005 May 31 - added Nadir's C# demo. 2005 Jul 18 - updated Les Hamilton's VB5 demo to demonstrate the MakePassDetails function. V3.5.0 2005 Jun 16 - fix memory leak with duplicate satellite names. 2005 Jul 17 - increase error-checking in MakePassDetails (where a direction other than N, n, S, s is specified, where the satellite name is mis-spelt). 2005 Jul 17 Les Hamilton updated the VB5 demo (V6.0 update to make use of the function 'MakePassDetails'). V3.6.0 2006 Sep 02 - add function MakePassDetails2 which includes the range rate. 2006 Sep 13 - add Java class and demo project from Henk Marais. 2007 Jan 15 - update Les Hamilton's VB5 demo. 2009 Jun 07 - restore C# demo. 2011 Mar 17 - add note about needing Administrator mode for REGSVR32 with Windows-7. This is exactly the same core code as used in WXtrack, but is provided without support. Scott Hather is using a version of this DLL in the current version of his SatScape software. If you get an 0x80004005 error message, you were not in Administrator mode. If you have an R2FX, R2ZX, R139 or RX2 receiver, you may have wanted to control it from your computer so that important passes were collected, and not ruined by other satellites capturing the receiver. My PassControl program allows this scheduling, and being RS232-based, it works under Windows XP, 2000, NT etc. as well as Windows 98 and ME. This program has been fully updated for the new GEO PIC 1.0 and for Kepler data for NOAA-18 & NOAA-19. Hardware requirements: an R2FX, R2ZX, R139 or RX2 Receiver modified for serial remote control. V3.1.0 Support GEO's R2FX (standard) and R2ZX (pager-proof) receivers - from the GEO Shop. V3.2.4 Update for proposed NOAA-18/NOAA-19 frequency swap. V3.3.2 Update for NOAA-15/NOAA-17 frequency swap. Please note: If you are upgrading PassControl under Windows 2000, the first time you run the program you may get an error dialog box, possibly with the message "Catastropic error". This error will go away once a valid location for the Kepler data is entered. Note that Windows 2000 is not a supported version. Now have their own page - please click this link.